Dating to 1893 is this astonishing and altogether hypnotic board game featuring a great many of the stars of the day. 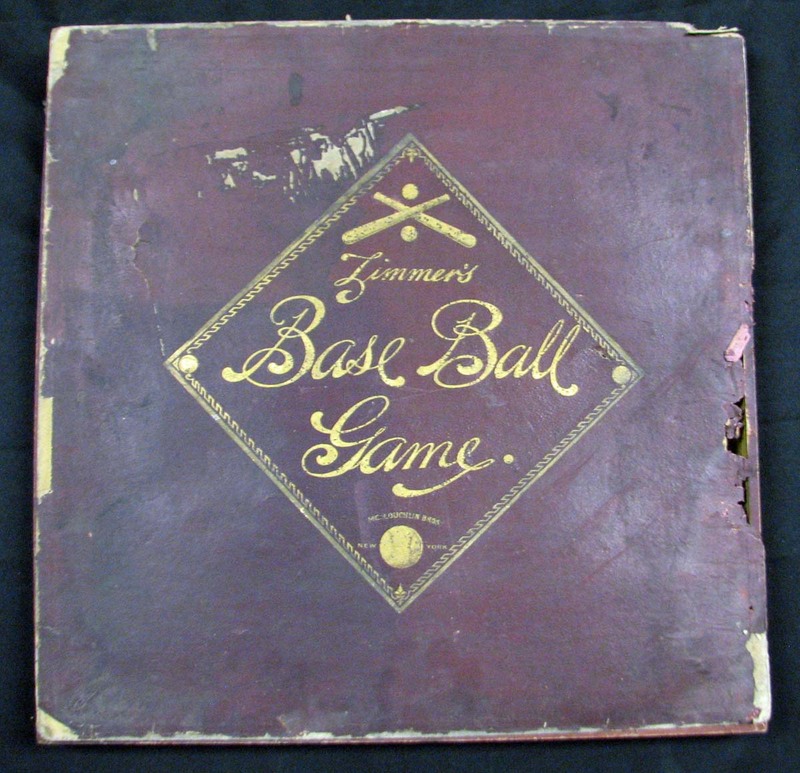 Although his name is affixed to the game, Charles Louis “Chief” Zimmer – the Cleveland Spiders’ catcher during the latter part of the 19th century – did not invent it, nor did the game-making behemoth McLoughlin Bros. It was a man named Joseph A. Meaher of Cleveland who got the idea patented in February of 1893, according to Shieber. 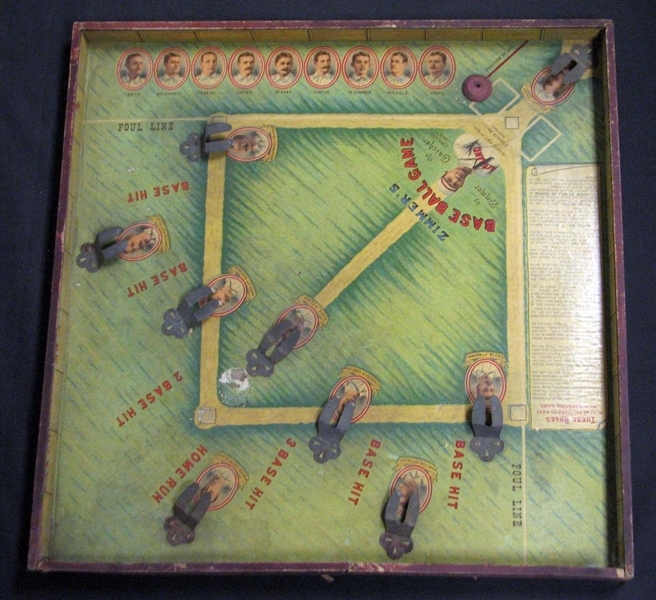 While Meaher was likely responsible for the game’s set-up as well as the painting of the field and the children peeking over the one-and-a-half-inch outfield wall, it was no doubt McLoughlin Bros. – revered for their lithographs – that created the instructions along with the image of Zimmer and 18 other portraits, including 11 Hall of Famers. While a good but not great baseball player (he was not a Hall of Famer), Zimmer was one of the first athletes to actively pursue self-marketing. In addition to the board game, Zimmer endorsed a line of cigars. “There were a lot bigger names,” said Shieber, who speculates whether Meaher’s hometown loyalties may have played a part in the sale to McLoughlin Bros. 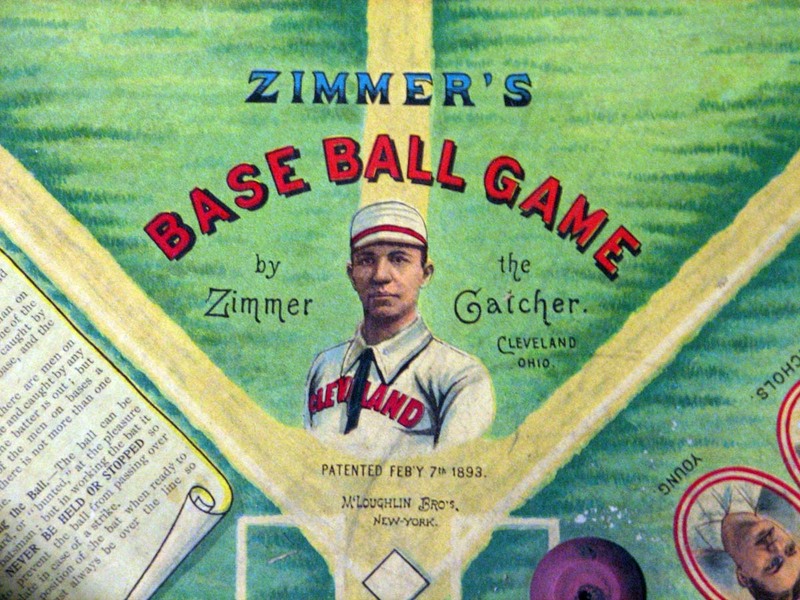 But two teammates of Zimmer’s in Cleveland were Cy Young and Buck Ewing, both of whom are Hall of Famers. The seventh player in the lineup is Chief Zimmer’s younger brother, William Zimmer, who never made it past the minor leagues. a roster packed with names that today appear in Cooperstown bronze. 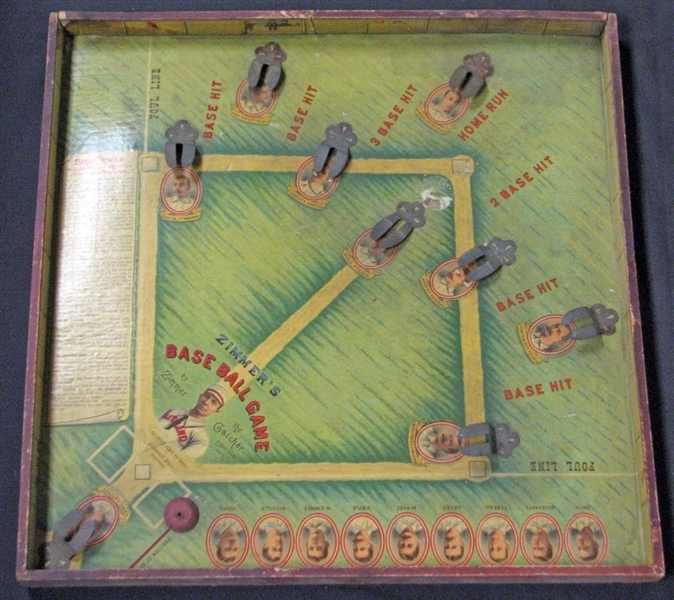 In the field we find Buck Ewing (catcher), Amos Rusie (pitcher), Dan Brouthers (first base), John Montgomery Ward (second base), John Glasscock (shortstop), George Davis (third base),Sam Thompson (right field), Jimmy McAleer (center field) and Billy Hamilton (left field). Portraits in the dugout: Cy Young, Kid Nichols, W. Zimmer (the aforementioned relative), Jacob Virtue, Bid McPhee, George Davies, Patsy Tebeau, Ed Delehanty and Germany Smith. 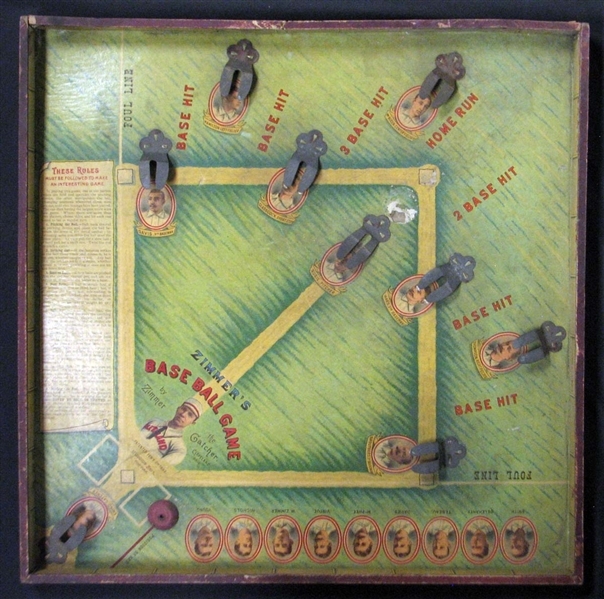 Pictured in front of the plate is accomplished Native American catcher "Chief" Zimmer. The portraiture throughout is magnificent, every bit the equal of the tobacco cards of the era. 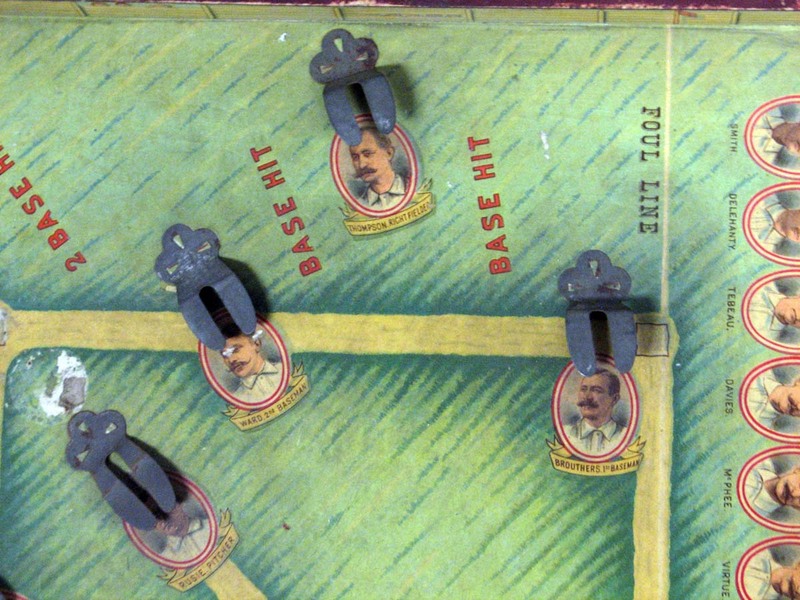 The featured collectible is a recently discovered relic that can now be added to the about 10 known copies of this famed board game. 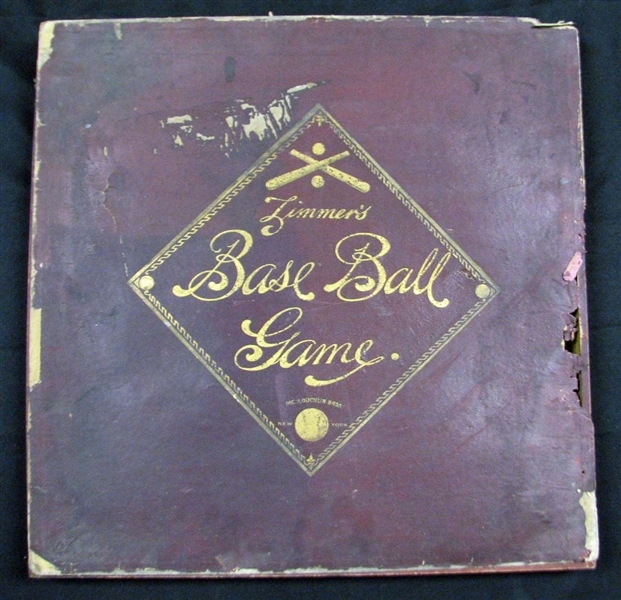 In regards to the condition: the offered keepsake may be the only known example that we have been able to locate through our research that has the original lid to the board game, although in rough condition the cover does display an attractive diamond shaped design signaling it as the Zimmer's Base Ball Game McLaughlin Bros. New York in a gold leafing set against a rich Burgundy brown background. (I believe the cover would be an ideal candidate for professional restoration. The interior of the game and the board are in above average condition with the left field wall having been glued back into place as wells an area behind Amos Rusie missing some stock as well as a couple small abrasions to the face of Monte Ward. As well the original ball and bat are not with the game. A terrific opportunity to acquire this exceptionally rare and attractive game. Auction closed on Friday, October 5, 2018.